Could Drones Replace Human Captains on Cargo Ships? Home » Could Drones Replace Human Captains on Cargo Ships? 75 percent of accidents at sea are caused by human error. A European Union-funded research project called MUNIN is hoping to make the seas a whole lot safer by creating autonomous ships that can sail themselves from port to port using drones. Are Drones Safer than Humans? In addition to increased safety, drone ships would reduce energy consumption by lessening weight and not having a need for fresh water. Drone ships would also be less expensive than a ship with a full human crew. The project is the subject of a workshop at a maritime conference in Hamburg, Germany. MUNIN is being led by researchers from the Fraunhofer Center for Maritime Logistics and Services. The goal is to prove the safety of unmanned ships, then push for changes in international maritime regulations to allow them to ply the seas. Nearly all of the technology required to operate ships autonomously is already available, as Ørnulf Rødseth, a researcher at the Norwegian Marine Technology Institute, said in a report. When Will These Drones Pilot Cargo Ships? Rødseth acknowledges that having the technology and getting governments and international authorities to use it are two different things entirely. In order to get regulatory approval, researchers must demonstrate that the lower speeds and automated responses of robotic ships could actually reduce collisions and other accidents at sea. The biggest technical challenge of a totally self-sufficient ship would be the issue of hardware failure. A loss of sensor data or communications would be practically impossible to deal with without people onboard. On the other hand, researchers believe that a single operator could pilot up to 10 cargo vessels at one time from a landside control center, using a three- to four-megabit-per-second data link to each ship. For now, entirely automated ships are at least ten years in the future. Researchers believe, however, that the MUNIN technology could be adapted to existing ships far sooner. In the meantime, cargo ships must be crewed by men and women, and human control can sometimes mean human error. If you or a family member works on a containership that fails to follow safety regulations, you may need to consider a lawsuit. 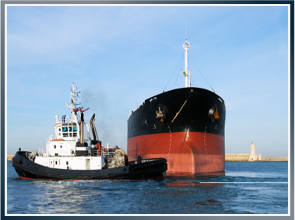 The maritime attorneys at Latti & Anderson LLP have decades of experience in these matters. Call us right away for a free consultation. Latti’s Little Extra: According to Rødseth, 75% of all accidents at sea are caused by human error. Previous What Happens When Cars Crash on a Ferry? Next Can Life Jackets Save Lives?